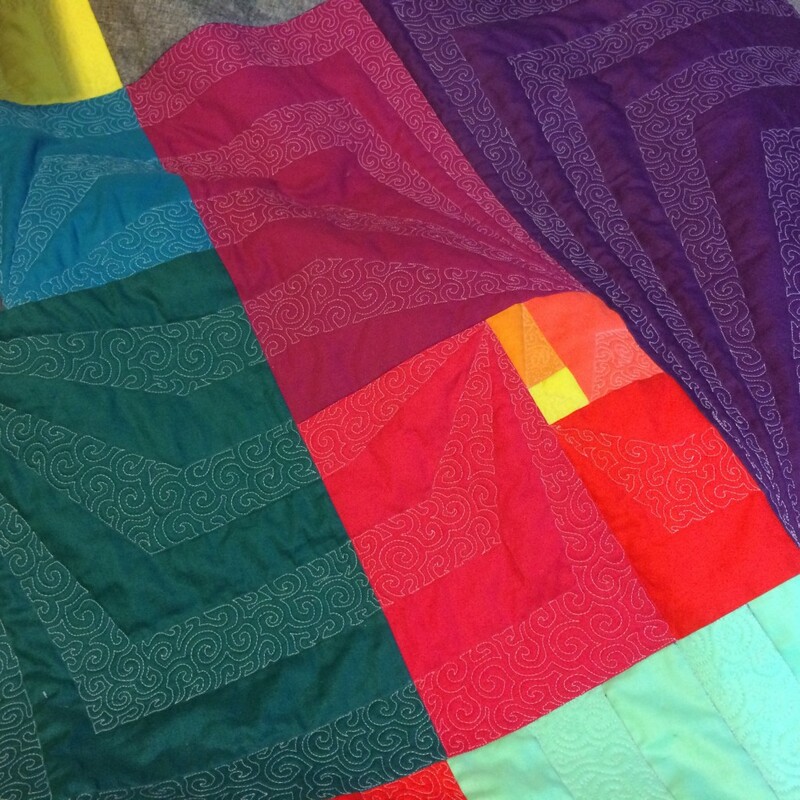 When I made the first Fibonacci Squared quilt last year, I knew I wanted to make another one using 21″ blocks that would come out to an 89″ square, or about a Queen-sized quilt. I started gathering fabrics, and I was excited about this combination except that it was too much of a repeat of the one I did last year. 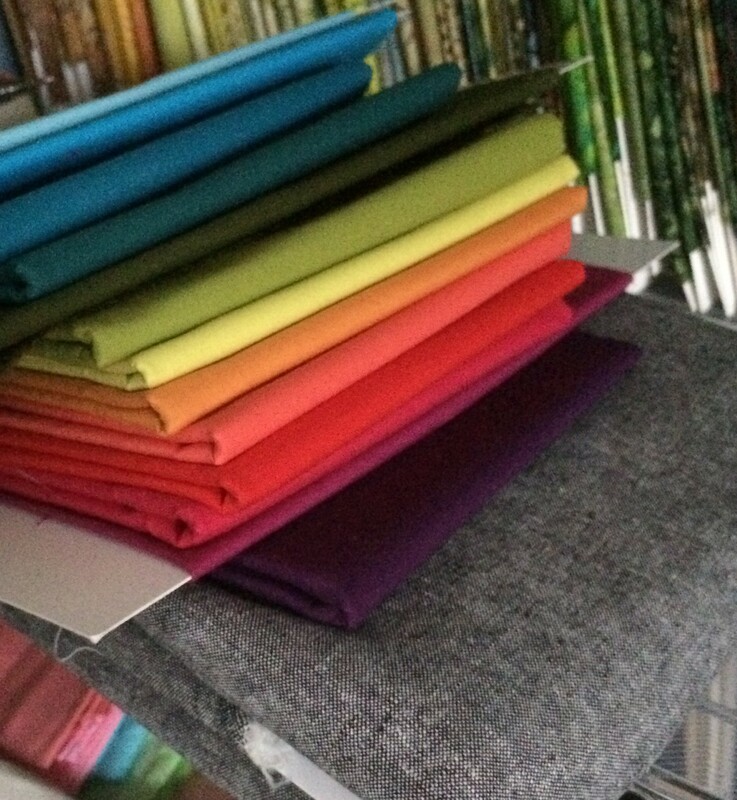 I took out some of the fabrics and added a seafoam green, light gray, and medium gray to shake things up a bit. 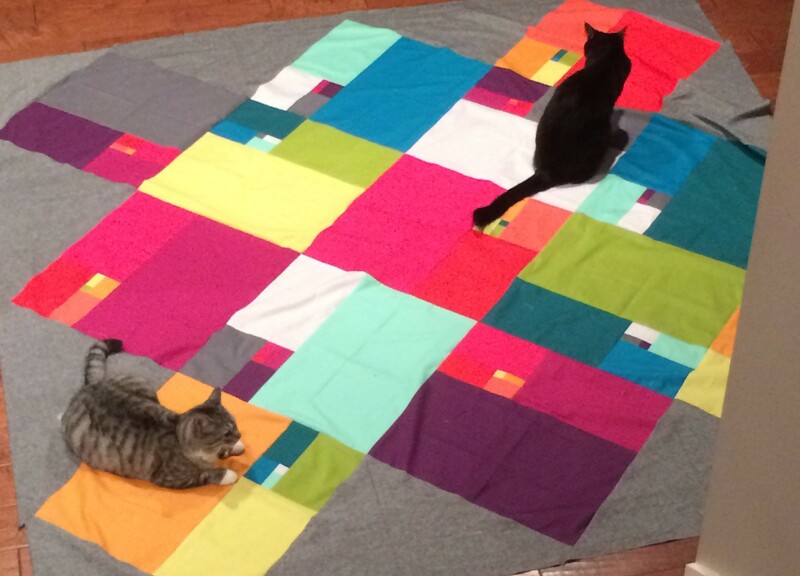 The blocks only have 7 pieces, so the blocks all go together in a quick evening of sewing. 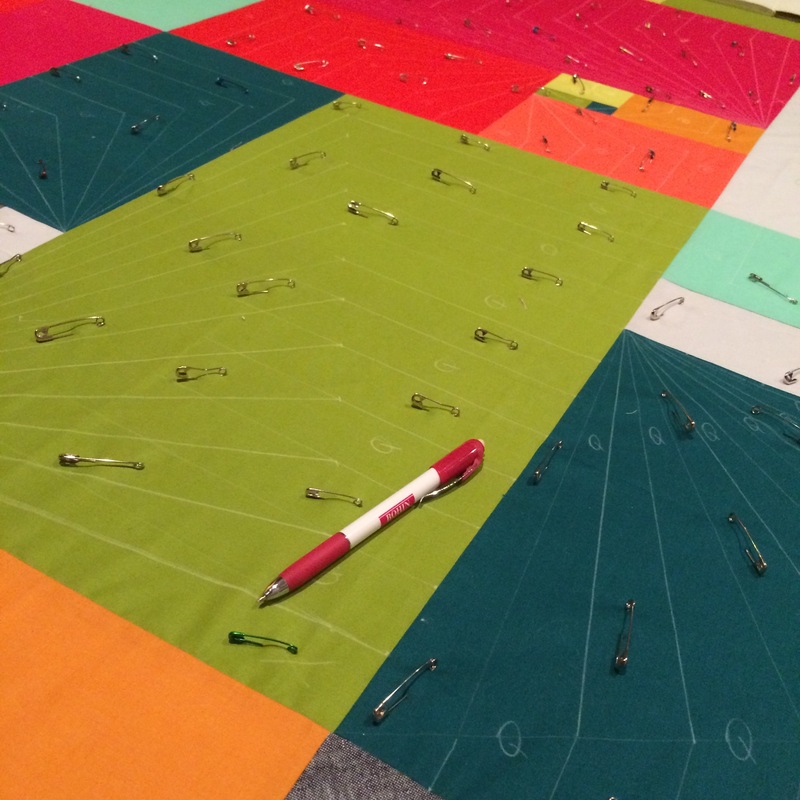 I attached setting triangles in Essex Linen in black, and laid it out on the floor to admire it. Friday and Ella, as always, were nearby. 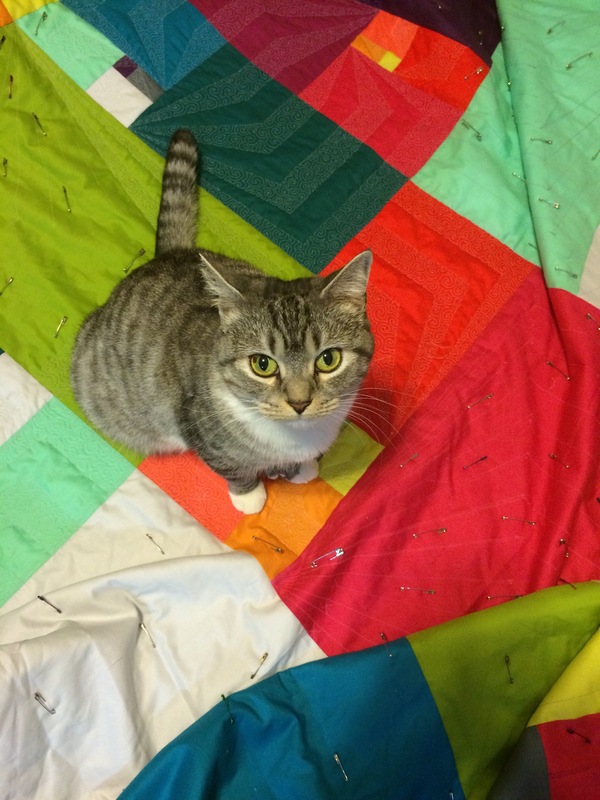 Ella immediately dove into the quilt top and did this, and then sat to the side and tried to act innocent. If you listen carefully, you can probably hear cat giggles. I straightened it back out and both cats decided to claim it. Jerry and I pinned it one night, and I marked as much as I could before I ran out of chalk. It took quite a bit longer than I expected it to, and I was quite sore the next day from the hours crawling around on the floor. 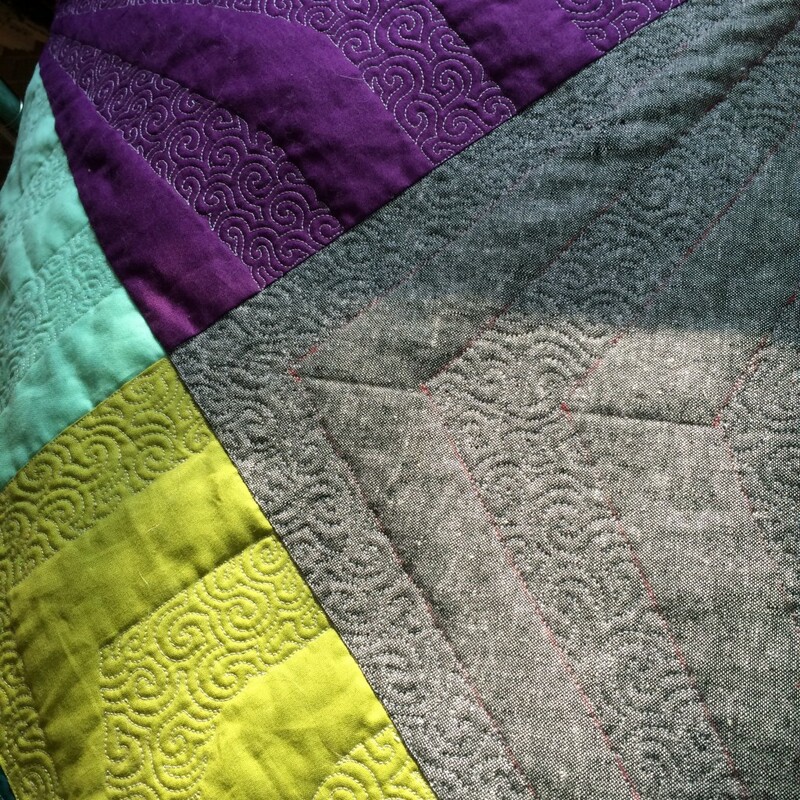 I started quilting it with Aurifil 50-wt thread in #2600 Dove, my new favorite color. It plays white without glowing, which I really like a lot. 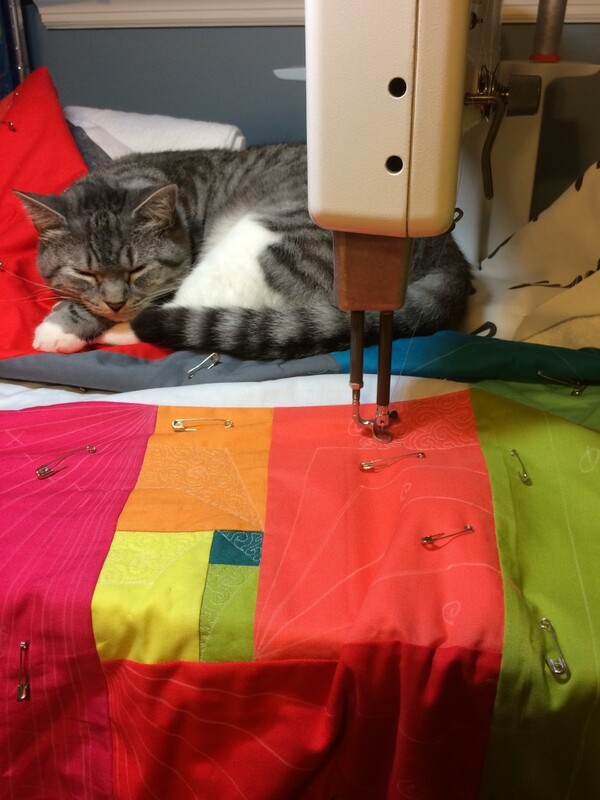 Ella let me know when it was time to stop quilting for the night. She’s helpful like that. 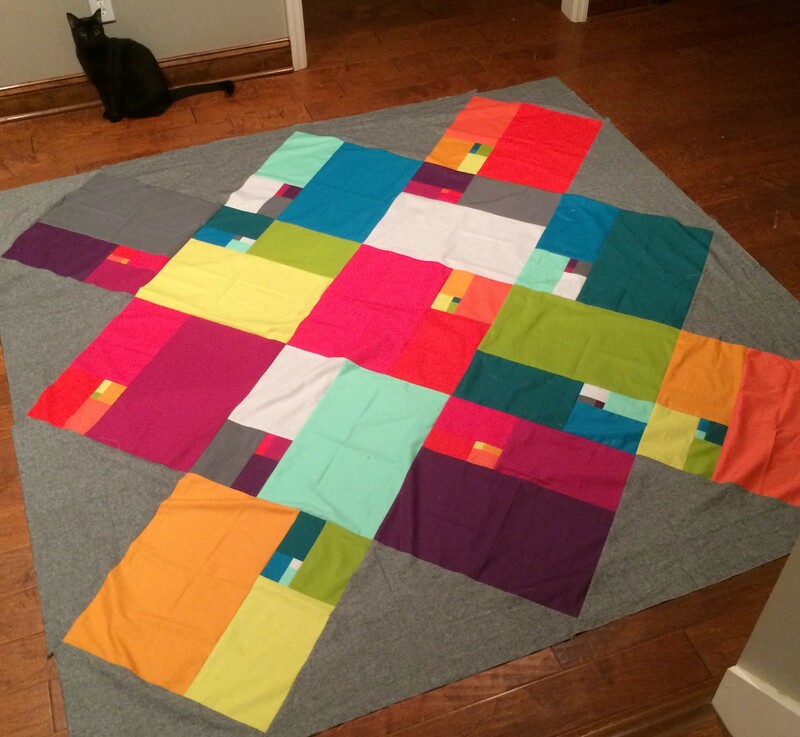 She also wanted everyone to be sure to acknowledge that this is HER quilt because she looks very nice on it. 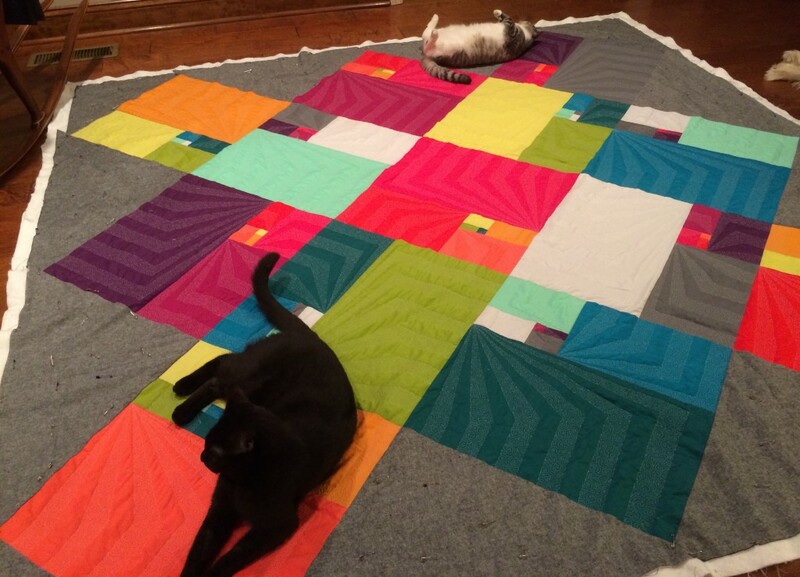 I spread it out on the floor to see how the quilting was looking, and less than 10 seconds later she was on it. 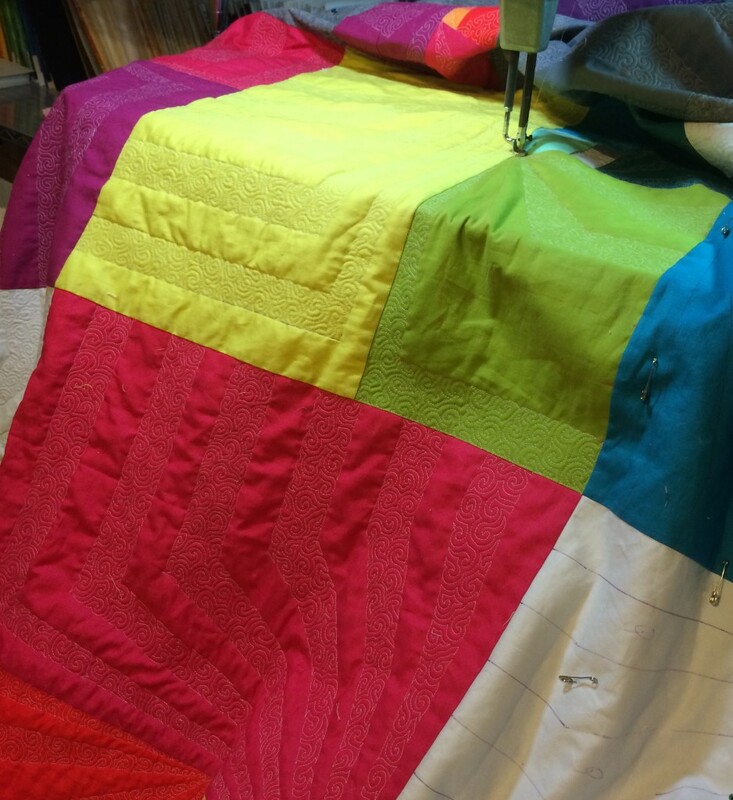 This is my favorite section because the quilted parts bleed into each other so nicely. 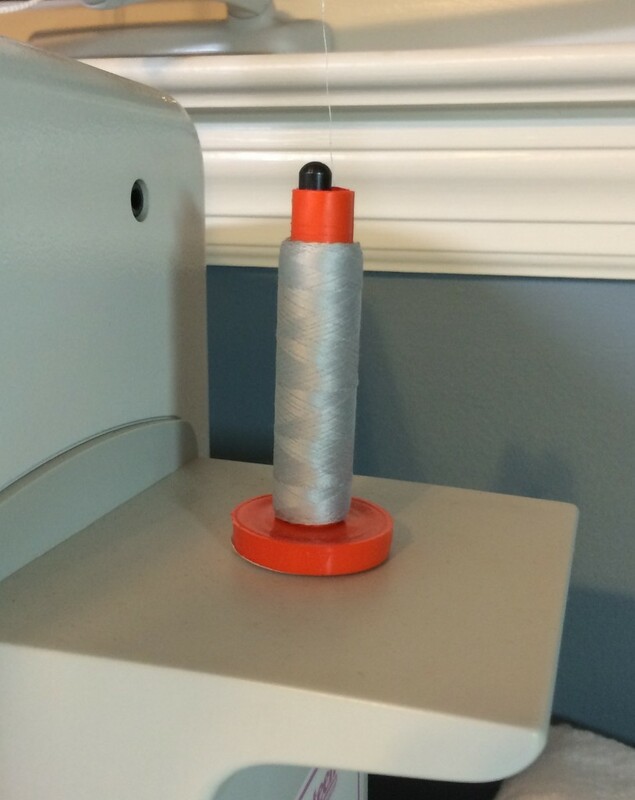 When I was about 1/4 of the way through the quilting, I realized that this spool wasn’t going to be enough to finish the quilt. Since it’s the second large spool of this color that I have used up since Christmas, I ordered a whole gigantic cone of it. 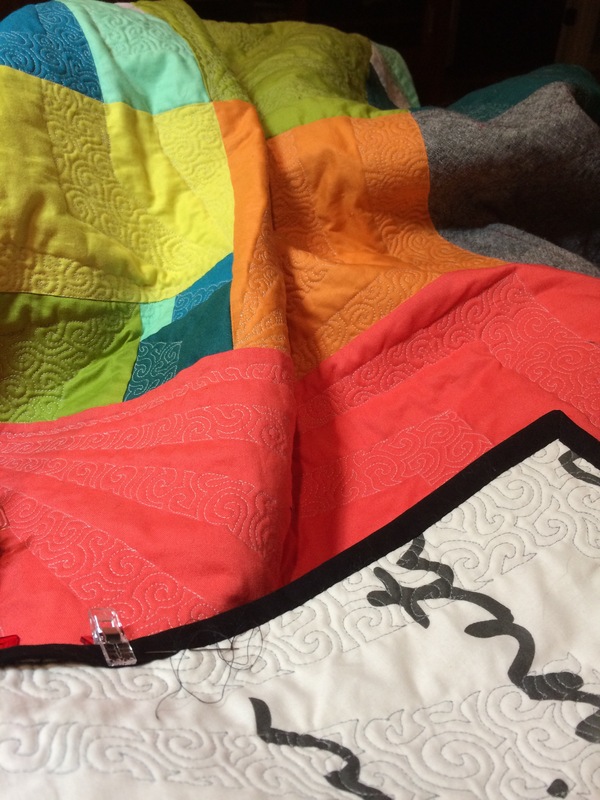 It arrived while I was in Chicago on a school trip, so I was able to continue quilting immediately after I finished this spool. 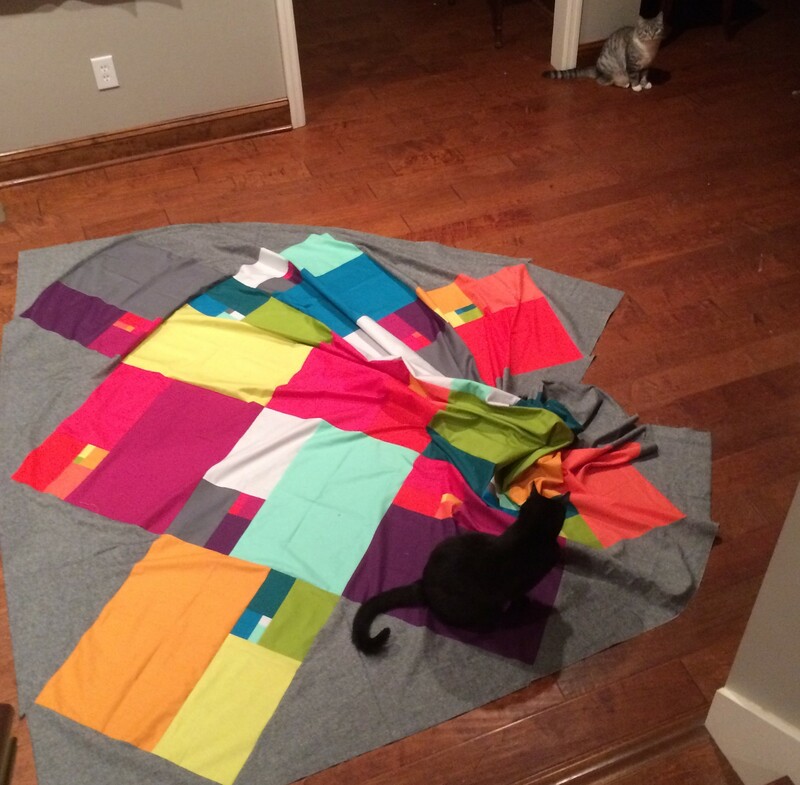 When I finished the interior quilting, I put it on the floor again for photos. Once again, there was frolicking. Ella was rolling back and forth, shimmying across one edge. Friday sphinxed on the opposite corner, as he usually does. 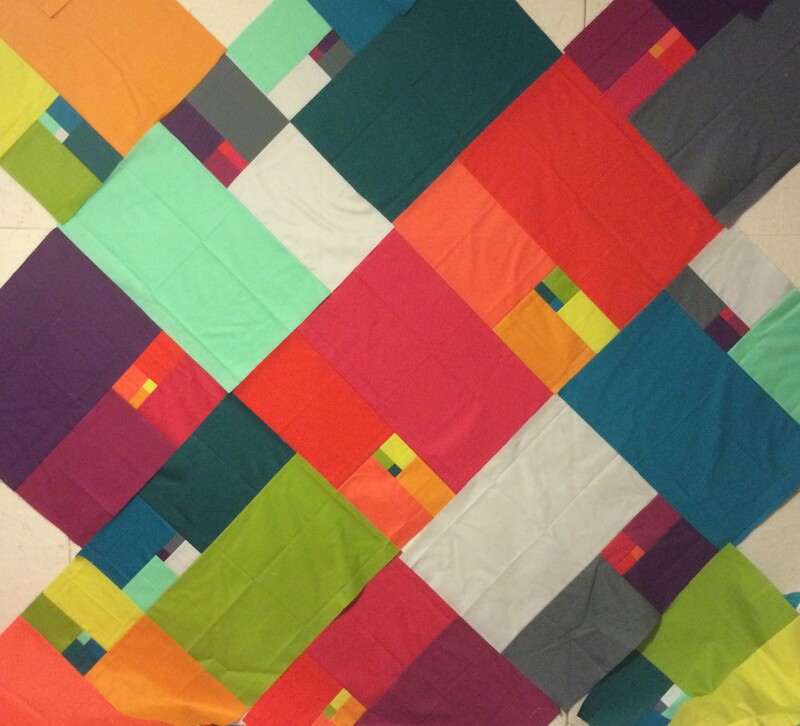 I decided to use the same quilting concept and filler that I did last year, even out into the setting triangles. It worked so well on the original Fibonacci Squared that I didn’t see the need to try to improve on it. 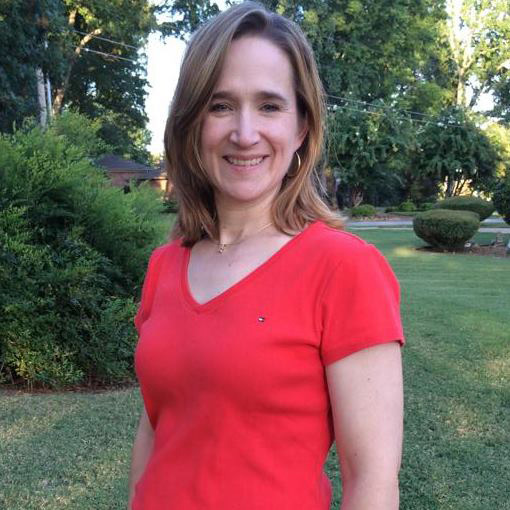 I do like it better in the more subtle thread color, though. The setting triangles were tough to quilt, because the dark gray thread was all but invisible on the setting triangles even with two Ott lights shining down from different directions, as well as natural light from the window. I had to rely a lot on muscle memory to make sure I didn’t cross over previous stitching. I wasn’t 100% successful but it’s hard to find the mistakes, especially from the front. I finished putting binding on it last night, and tonight I’ll wash it to get the markings out and get it to crinkle up a little. Then, fence photos and I can finish up the pattern for publication!